Do you know which department is improving the most every year for your dealership? With the last quarter and the year soon coming to a close, it is a great time to examine how 2017 started off for car dealerships to properly prepare for the upcoming year and Q1. You are allocating budgets, putting 2018 plans in place and (hopefully) setting goals. All future planning and decisions should be being made based off of real data that your dealership has been accumulating to make smart decisions to improve. In which department should you be investing more money? Where are there improvements to be made, and what areas of the business have been increasing? The good news is, things for auto dealers have been looking brighter since 2015. Although appointments were up in all three departments, there is still one clear department that has been improving more than the others. According to CallSource’s analytics data, appointments set during the first quarter have been steadily increasing in all three departments: sales, service, and parts, since 2015. Below are CallSource’s findings for 2017’s first quarter, which was the best yet for dealerships (1,2,3,4). 10.5% of examined sales calls resulted in appointments; up 1.8 and 2.9 percentage points from 2016 and 2015 respectively. 9.6% of examined service calls resulted in appointments; up 2.9 and 5.1 percentage points from 2016 and 2015 respectively. 0.8% of examined parts calls resulted in appointments; up 0.5 percentage points from 2016 and 2015 equally. Inbound calls AND appointments for service lead the growth in inbound bookable prospects. 24.6% of bookable calls during 2017’s first quarter were for the service department – compared to 14.6% in 2015. To compare, sales appointments were at 12% this year, and 12.7% in 2015. So what may be the reasoning behind this increase in service departments capturing more appointments year over year? Your dealership should be paying more attention to Fixed Operations for 2018! Fixed Operations departments are the way to keep your new customers coming back and to guarantee that they’ll want to purchase from you again. 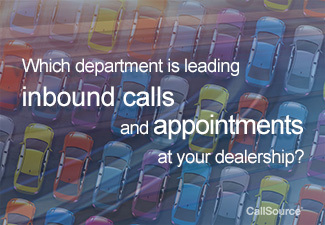 You know that competition between dealerships is never going away, especially when it comes to sales. Customers don’t yet have any loyalty to a particular dealership—they just want the best price and value for the car that they want. National Automobile Dealers Association’s (NADA) 2016 data also coincides with CallSource’s findings—they found that while a percentage of dealerships’ total gross profits fell in vehicle sales departments, they have risen in service and parts. Bottom line – you should be investing in your service department. Don’t try to cut costs simply because your sales may not be performing quite as high as you’d like. Throwing more money into sales initiatives isn’t the answer; those expenses can be better allocated to Fixed Operations. Look at the data before making these key decisions for the upcoming year. We’ll be elaborating on this topic soon—stay tuned for more insights on how to empower your service department to run at its highest capacity and to keep customers coming back.